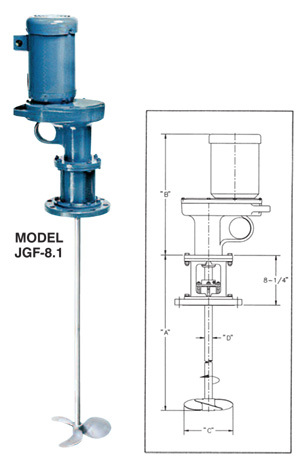 Series JGF mixers provide all the features of Series JG gear drive mixers, but with alternate flange mounts. Standard mounting flange is 6" carbon steel, 316SS optional. Optional flanges available in 8", 10", 12", and 14". JGF-2.0 1/3 HP-1-115/230 48" 17 5/8" 10" 8" 3/4"
JGF-2.1 1/3 HP-3-230/460 48" 17 3/8" 10" 8" 3/4"
JGF-3.0 1/2 HP-1-115/230 48" 18 1/2" 12" 10" 3/4"
JGF-3.1 1/2 HP-3-230/460 48" 17 5/8" 12" 10" 3/4"
JGF-4.0 3/4 HP-1-115/230 60" 18 3/4" 13" 11" 3/4"
JGF-4.1 3/4 HP-3-230/460 60" 18 1/8" 13" 11" 3/4"
JGF-5.1 1 HP-3-230/460 60" 18 3/8" 14" 12" 1"
JGF-6.1 1 1/2 HP-3-230/460 60" 18 3/4" 15" 13" 1"
JGF-7.1 2 HP-3-230/460 60" 20 5/8" 16" 14" 1 1/4"
JGF-8.1 3 HP-3-230/460 72" 21 5/8" 16" 15" 1 1/4"
JGF-9.1 5 HP-3-230/460 72" 23" 16" 15" 1 1/4"
JGF-2.2 1/3 HP-1-115/230 48" 20 1/2" 10" 8" 3/4"
JGF-2.3 1/3 HP-3-230/460 48" 17 3/8" 10" 8" 3/4"
JGF-3.2 1/2 HP-1-115/230 48" 21" 12" 10" 3/4"
JGF-3.3 1/2 HP-3-230/460 48" 19 5/8" 12" 10" 3/4"
JGF-4.2 3/4 HP-1-115/230 60" 21 1/2" 13" 11" 3/4"
JGF-4.3 3/4 HP-3-230/460 60" 19 5/8" 13" 11" 3/4"
JGF-5.3 1 HP-3-230/460 60" 20 1/2" 14" 12" 1"
JGF-6.3 1 1/2 HP-3-230/460 60" 20 1/2" 15" 13" 1"
JGF-7.3 2 HP-3-230/460 60" 22 1/8" 16" 14" 1 1/4"
12-20CFM @ 40-80PSI 48" 17 1/8" 12" 10" 3/4"
30CFM @ 60PSI 60" 18" 13" 11" 3/4"
40CFM @ 40PSI 60" 19 1/8" 14" 12" 1"
55CFM @ 60PSI 60" 19 1/8" 15" 13" 1"
65CFM @ 70PSI 60" 15 5/8" 16" 14" 1 1/4"
125CFM @ 90PSI 72" 16 3/4" 16" 15" 1 1/4"
JGF-2.7 1/3 HP Variable Speed, 1/115 V 48" 17 5/8" 10" 8" 3/4"
JGF-3.7 1/2 HP Variable Speed, 1/115 V 48" 18 1/2" 12" 10" 3/4"
JGF-4.7 3/4 HP Variable Speed, 1/115 V 60" 18 3/4" 13" 11" 3/4"
JGF-5.7 1 HP Variable Speed, 1/115 V 60" 18 3/8" 14" 12" 1"
* Using AC motor/control package.